The Roman Empire of 1-150 CE was at its greatest. It had conquered much to the east, and under Emperor Claudius, the empire seized land in Britain and the rest of the west. But the Romans knew other skills besides fighting and conquering. In their spare time, the Roman soldiers would view the imperial games (gladiatorial battles and chariot racing) and gamble. We chose this time period because we wanted to know more about iconic Rome. We chose this topic because we wanted to know what the soldiers spent their time doing. The reason why we choose gladiator contests as one of our subtopics is because it is probably the most iconic type of roman activities. They were probably the most popular type of Roman entertainment. Everyone has heard of the gladiators and automatically associates them with the Romans and the Colosseum. The gladiators were professional fighters that provided entertainment for thousands and thousands or Romans by fighting to the death in large arenas. They estimate that gladiator battles took place for over 500 years in Roman society. 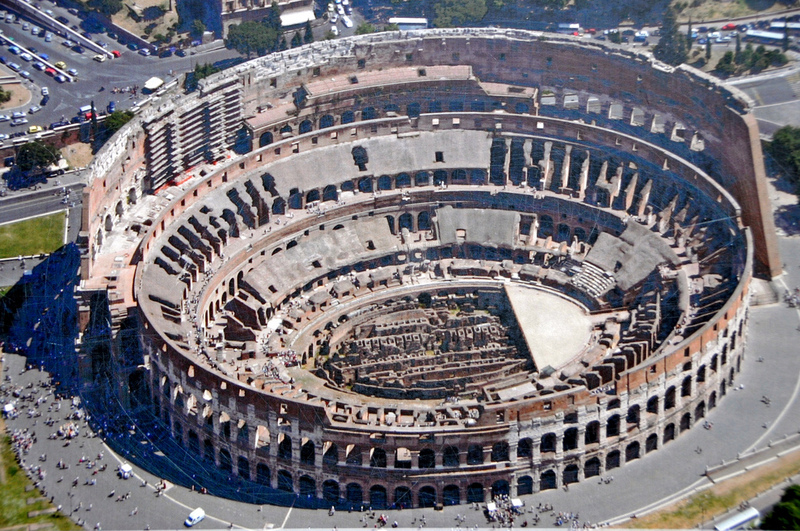 (Cartwright) The most famous arena in which these battles took place was the Colosseum or Flavian Amphitheatre. Up to 50,000 people could fit into this arena to watch the battles. (Lendering) I’m sure many roman soldiers attended these events regularly on their free time. There were usually around 10 to 12 gladiator battles a year in Rome. These battles provided regular entertainment for all types of Roman citizens from the poor to the rich and the soldiers to the civilians. Soldiers that were on leave were sure to attend such events and relieve stress from their daily lives in the legion. We chose the subtopic of chariot races because it is also a common and famous Roman activity. Chariot races is one of the first things I think of when I think about Ancient Rome. The Romans loved participating in large public events such as chariot races. In the races they usually divided up the racers into four factions- Blues, Greens, Reds, and Whites- and the people followed these teams similar to sport fans today. (Cartwright) Roman soldiers on there free time or leave were sure to participate in such social events and also have their own favorite team. 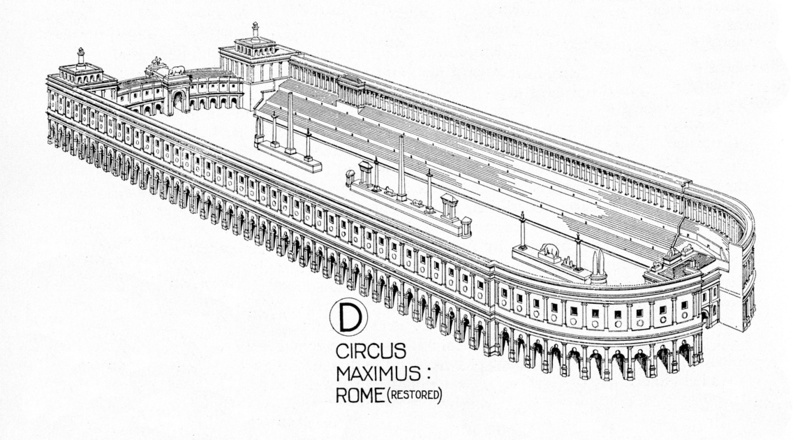 The most famous arena in which these races took place is called the Circus Maximus. It could hold up to 250,000 spectators. As you can see in the image to the left, there were center dividers in the arena and the chariot racers would race around those in a big loop. I would imagine that Roman soldiers would be big fans of these races and love to go to these events and cheer on their favorite faction. We chose gambling because it isn’t something we normally associate with Roman life and wanted to explore its hold on their society. Participation in this activity happened in every class in Ancient Rome. School kids as well as emperors enjoyed this form of entertainment. Emperor Claudius enjoyed it so much that he attached a gameboard to the side of his coach so he could play on the move. Gaming tables were carved into practically every flat surface in the area including sites such as the Colosseum, the Forum Romanum, the Basilica Julia, and the entrances to the temples of Venus and Rome. Gaming tables were “particularly abundant in barracks” (Toner). Soldiers in Christ’s time are said to have cast lots on his clothes (St Matthew). Soldiers and peasants, along with enjoying the imperial games, placed bets on them against their friends and neighbors. They would look at advertisements and programs to determine the fighters’ capabilities and found the pedigrees of horses to decide whom to bet on. Participants (in the games) were divided into four groups, each represented by a color, as mentioned previously. The red and white teams were on the same level, while the blues and greens were deemed superior (but equal to each other). The red and white teams could have odds of 6:1 where the blue and green teams could have odd of 2:1. In short, gambling was an activity enjoyed by many in Imperial Rome. It pervaded social class and occurred at many levels of play. From the Roman Colosseum to the military barracks, one person’s success was another man’s failure. In conclusion, the Roman soldiers (and other people for that matter) loved their glory and their bloodshed. In their free time, soldiers flocked to the imperial games to view and bet on the gladiatorial battles and the chariot races. Once leave was over, it was time to conquer. Mark Cartwright. “Roman Games, Chariot Races & Spectacle,” Ancient History Encyclopedia. Last modified December 04, 2013. http://www.ancient.eu /article/635/. Lendering, Jona. Rome, Amphiteatrum Flavium. 21 July 2010. 4 November 2016. <http://www.livius.org/articles/place/rome/rome-photos/rome-amphitheatrum-flavium/&gt;. Toner, J. P. “Gambling.” Leisure and Ancient Rome. Cambridge: Polity, 1995. 89-101. Print. The Holy Bible. Salt Lake City: The Church of Jesus Christ of Latter-day Saints, 1979. Print. King James Version.